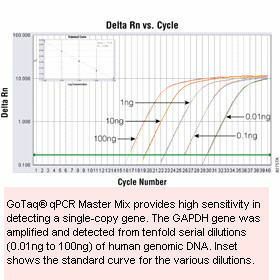 GoTaq qPCR Master Mix is a ready-to-use, stabilized 2X formulation containing GoTaq(R) Hot Start Polymerase, MgCl2, dNTPs, BRYT Green(R) Dye and a proprietary reaction buffer. The GoTaq qPCR Master Mix is optimized for fast and reproducible quantitative PCR assays using a double-stranded DNA-binding dye. The master mix contains BRYT Green dye, a novel fluorescent DNA-binding dye with minimal PCR inhibition for maximum PCR efficiency and greater fluorescence enhancement upon binding to double-stranded DNA (dsDNA) than SYBR Green I. The master mix is provided as a ready-to-use, stabilized 2X formulation and contains GoTaq Hot Start Polymerase, MgCl2, dNTPs, BRYT Green Dye and a proprietary reaction buffer. This master mix contains a low level of carboxy-X-rhodamine (CXR); a separate tube of CXR reference dye is included. The master mix contains BRYT Green® dye, a novel fluorescent DNA-binding dye with minimal PCR inhibition for maximum PCR efficiency and greater fluorescence enhancement upon binding to double-stranded DNA (dsDNA) than SYBR® Green I. It's optimized for fast and reproducible quantitative PCR assays using a double-stranded DNA-binding dye.